You’re listening to a speaker. It could be a teacher in a class you’re taking. Maybe it’s a co-worker training your team in a new process. It might be a pastor delivering a sermon. Perhaps you paid to attend a seminar where the speaker is an expert in a field where you want to learn more. 1) The presentation is so disjointed and rambling that no one in the audience can keep track of the main points. It seems like the speaker is lost and going off in one new direction after the other. 2) The speaker uses a lot of business jargon that you don’t know the meaning of. There are so many facts and statistics thrown in that you can’t keep track of their significance. Sometime the speaker merely hints at some points without really identifying them. Just when you think you understand a point, well…no, that’s not it. This is highly frustrating for an audience. 3) The body language and voice of the speaker are that of a person who has no confidence in herself or in what she is saying. The speaker is either reading from a manuscript or scanning the room without really looking at anyone. You find that you’re asking yourself if the person actually believes her own message. The speaker’s credibility fades as the presentation goes on. Any talk that you give—whether it’s to a class of middle school students, a team of five for fifteen minutes, a congregation of 150, or an hour’s presentation to a large audience—must be FUBR (rhymes with Uber) for the audience. Follow – An audience needs to be able to follow the presentation. Don’t leave them guessing when you’re ending one main point and beginning another. Understand – They need to be able to understand the meaning of your words to get your message. Believe – A speaker’s voice and body language need to enhance the spoken words to strengthen the message. Really look at individual members of your audience while you speak. 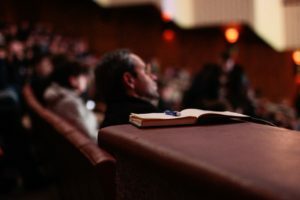 Remember – If an audience can’t remember the speaker’s presentation, what’s the point of having sat through it? An audience (no matter the size) comes to us with hopeful expectations. They may believe that the speaker can help them solve a problem. An audience may want to be inspired to make a change. Some people want to learn a skill or enhance their existing knowledge of one. They’re looking for an experience that will help them. An audience wants to feel included, respected, and engaged. If you use the FUBR model, your audience will come away from your talk feeling just that.